Over the last two weeks, I have almost completed learning the lowercase letters of Copperplate script. I have also acquired all the materials I would need for calligraphy. Those materials include an elbow pen, straight pen, 4 nibs (different types), Sumi ink, and several types of paper. 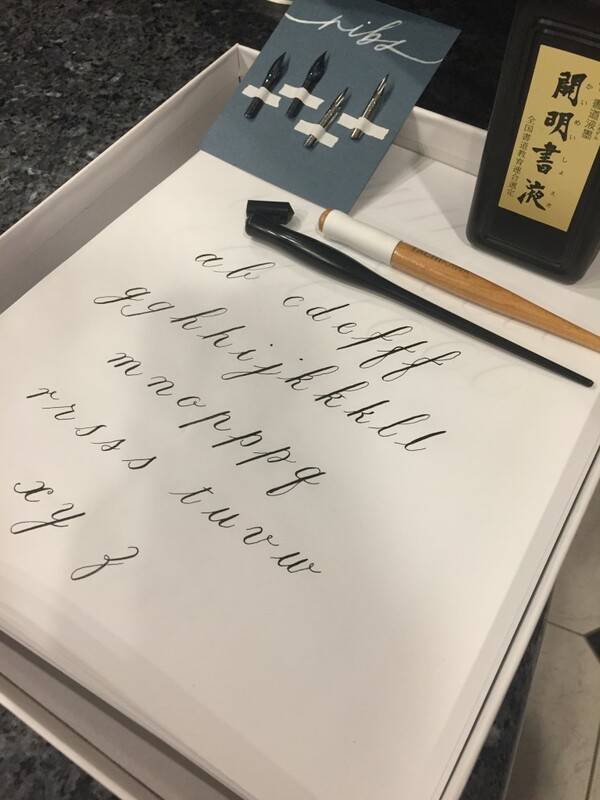 Learning the lowercase letters just includes learning the shapes and strokes that each letter consists of, and then writing that letter repeatedly until you are confident with it and until it looks exactly like the Copperplate script is supposed to look like. This might sound somewhat dreary and repetitive, but I have found it to be an incredibly relaxing way to de-stress. I think the repetitive motions and the amount of concentration required to make a perfect line takes your mind off everything except the task, or letter, at hand. There are some blank spaces in the picture between some letters. This is because letters often have several different variations that I have not completely learned yet. These variations are mostly for personal preference, but some only apply in rare case scenarios or only with other specific letters. When meeting with Liza Child, I was able to apply some of De Bono’s techniques. When I tried out my first couple of strokes and letters, Liza gave me a special type of practice paper with slanted lines, so I know the exact degree of the calligraphy slant. This reminded me of a very similar practice paper I used in Russian school, which made Liza interested, stimulating a lot of conversation about my prior experience with Russian cursive. This personal story was also a response to the conversation about the paper that we were working with. Another example of a response was because I needed clarification on how to write a letter. Each letter has a specific design, a series of strokes, and pressures applied to specific parts of the letter. Due to this, I needed to clarify many letters to make sure I had every letter perfect.